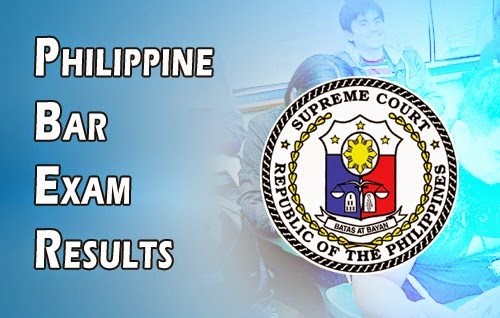 November 2015 Philippine Bar Exam Results (List of Passers and Topnotchers) - Balita Boss! The Supreme Court (SC) conducted the 2015 Philippine Bar Exam last November 8, 15, 22, and 29 at the University of Santo Tomas in Manila. A passing rate of 26.21% or total of 1,731 out of 6,665 examinees passed the November 2015 Philippine Bar Exam. Oath taking is on June 16, 2pm at the PICC. UP Law student Rachel Angeli Miranda topped the November 2015 Philippine Bar Exam with a passing rate of 87.40 percent. J. De Castro: Out of 6,665 examinees, 1,731 passed or 26.21%, passing is 75%, no adjustment. Source: Bar topnotcher (#1), including numbers 3,6 and 9 in the Top 10 are from UP. During the last bar examination conducted last October 2014, a total of 1,126 out of 5,984 examinees passed the Bar Exam, SC announced.